Please also note that there is also a tax rebate of up to Rs.2,500 for a taxable income up to Rs. 3.5 lakhs. The tax rate for companies with an annual turnover of up to Rs 50 crore has been brought down to 25% from 30%. Besides the above change, other rates remain the same as were in the previous year. Please see the income tax slab for domestic companies for FY 2016-17. Please also note that there is also a tax rebate of up to Rs 5,000 for a taxable income up to Rs 5 lakh. How to Calculate Income Tax from Income Tax Slabs? This example explains how to apply tax slabs to calculate income tax for FY 2016-17 (AY 2017-18). Rohit has a total taxable income of Rs 8,00,000. This income has been calculated by including income from all sources such as salary, rental income, and interest income. Deductions under section 80 have also been reduced. 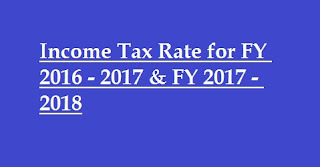 Rohit wants to know his tax dues for FY 2016-17 (AY 2017-18). **Please note that Rohit is an individual assesse having an income tax exemption of Rs 2,50,000. For other assesse as mentioned in table Part II and III, the Income tax limit for availing the exemption would be Rs 3,00,000 and Rs 5,00,000 respectively. 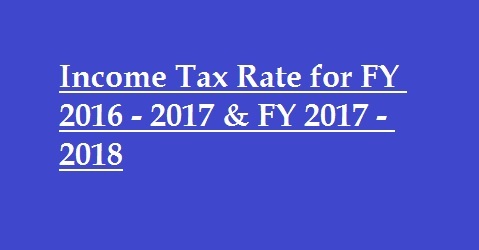 Income tax rate reduced to 29% (plus applicable surcharge and education cess) for domestic companies whose total turnover/gross receipts does not exceed Rs 5 crores. In case you formed a manufacturing company, income tax rate of 25% for domestic companies, if set-up and registered after 1 March 2016 and does not claim any tax incentives.In other cases, the tax rates remain unchanged at 30% (plus applicable surcharge and education cess). If you are registered as a company, the income tax slab rates do not apply to you. Domestic companies are taxed at 30% on the total income. A 5% surcharge is payable if income is more than Rs 1 crore but less than Rs 10 crore. If total income is more than Rs 10 crore, 10% surcharge is applicable. Although total income is taxable at income tax slab rates mentioned above, some incomes are taxed at special rates.